For some small businesses and organizations, building a library of video content on YouTube sounds like a daunting task. But you shouldn’t let your initial nervousness get in the way of giving this powerful channel a try. The most important thing you’ll need for a successful YouTube channel is probably something you already have — an understanding of who your audience is and what kinds of things they find valuable. Video content can help your branding efforts and show off your business expertise; but it’s also a great way to entertain, educate, and connect with people. Before you do anything, you need to figure out what you’re hoping to get out of building a presence on YouTube. 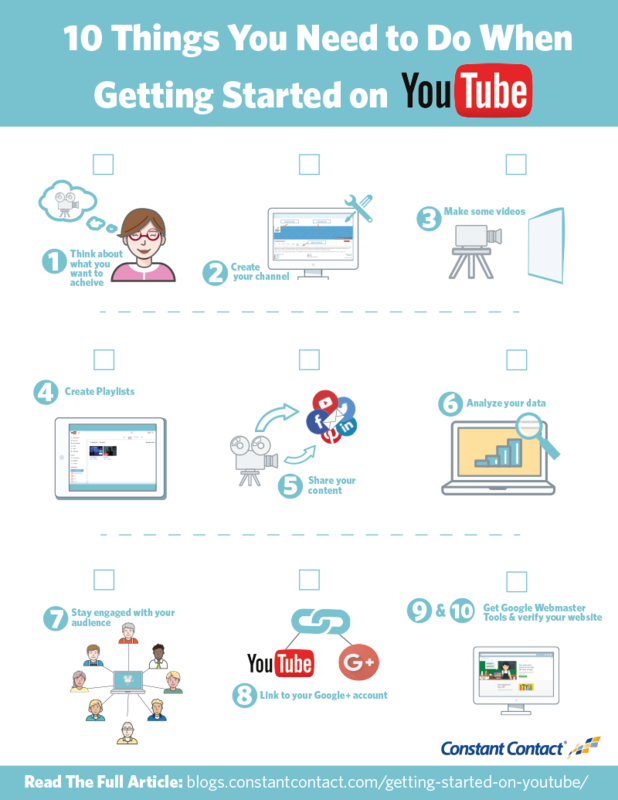 This will help you decide what type of videos you want to create and define the right audience for your content. Having a goal in mind from the start means you’ll be creating content that your audience will want to subscribe to, bookmark, and share with a friend or colleague. If you focus on content that is useful to your audience, your viewers will see you as a trusted resource of information. It’s important to do a little housekeeping before you start promoting your new page — you want to make sure you make a good first impression on your visitors! Upload your company logo to the channel icon box at the top left of your channel page. If you don’t have a logo, use a quality image that represents your business in a professional manner. Here are some tips for making your image the right size for YouTube. The about section is an opportunity for you to tell people who you are, what you do, where to find you, and how to get in touch. Be sure to link to all your other social networks so that people can follow you on multiple channels. You should also link to your company website here. Be careful when choosing your channel art. I suggest using a simple design or pattern that is consistent with your company’s branding. Also, make sure you have the rights to use image you choose. Lastly, go check out what these images look like on other devices to make sure everything looks good. Phones, televisions, tablets, and desktops all show the channel art at different dimensions. This is the fun part! Gather up all the equipment you have and go shoot some video footage. Even if you’re only working with your smartphone, you can still make a really great video as long as it’s useful. Once you’ve created a few videos, group them together into playlists on your channel. Even if you only have a few videos, it’s a good idea to put them together on a playlist. I like to do this because the title you choose for your playlist can help you get ranked higher in Google search results. Playlists will also encourage people to watch more of your videos because they’ll see a list of the rest of your videos in the series, which makes your content more episodic. Auto-plays do a good job of engaging viewers to watch multiple videos, with no effort on their part. One of my favorite YouTube channel features is that you are given the option of having playlists featured on your YouTube channel page. Not only do you get to organize and categorize your content, but you can also highlight the videos you want to draw the most attention to and get creative with the presentation. While your videos may get some traffic through search alone, don’t hesitate to promote your videos through your other online channels. The people who have already connected with you on Facebook, Twitter, Google+, LinkedIn, Instagram, and Pinterest are likely to appreciate your new videos as well. Here are 9 Ideas for Adding Video to Your Email Marketing Strategy. Once you’ve started putting your videos out there, go and take a peek at how people are engaging with them. Ideally, you want people watching your video all the way to the end. YouTube Analytics can show you if people are turning off your video at a certain point through the Audience Retention report. This is a good way to gauge if the length of your videos is right. Shorter and more engaging videos are often the most effective. For more information on all the YouTube Analytics categories and features you can use, check out my post on understanding YouTube Analytics. Not only can they learn from you, but you can learn from them about what you could be doing better to cater to your audience’s needs. Every comment you receive on a video is an opportunity to create a deeper conversation and connection. Be sure to link your Google+ account to your YouTube channel. This ensures that any comments your video receives on Google+ post will appear on the video’s dedicated YouTube page. That way all the feedback your video has generated is centralized in one location. Google provides detailed instructions on how to link the two accounts here. Annotations are clickable text overlays that you can put into any of your videos. 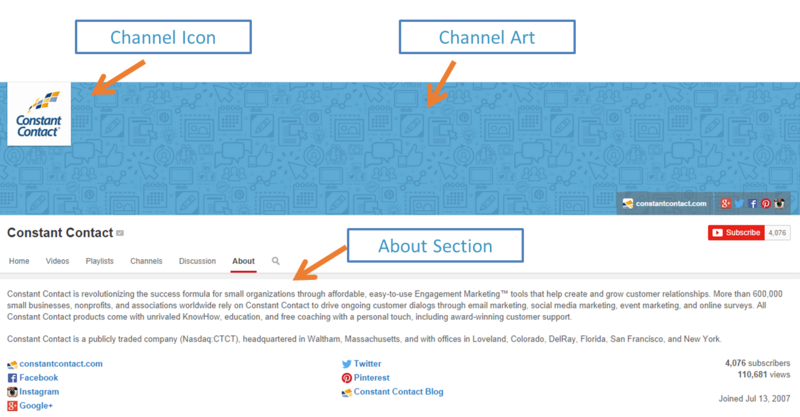 You can choose to link these annotations to another one of your videos or your channel page. Annotations are great for promoting your other video content. If you’d prefer to create an annotation that links to your website, you will need to verify your site by inserting a line of code into the homepage of your company website. This code is generated in your Google Webmaster Tools link. I highly recommend leveraging this feature to your benefit. Through managing the Constant Contact YouTube Page, I’ve found that people are often interested in learning more if you make it easy for them. If you have a blog full of great, relevant content, consider creating an annotation to direct them to your blog. Creating a vibrant and engaged YouTube channel may seem like a lot of work, but the reward is worth it. Videos help you become a trusted authority in your industry, as well as a personable source of entertainment. You don’t have to be a filmmaker or a video wizard to be successful on YouTube. All you need to do is figure out how you can offer your audience something of value. That way they’ll appreciate you effort, engage with you, and visit your page again and again.